Well the second bit of exciting news I alluded to in the previous post is still not ready to be revealed yet. I thought it would be by now so I’m itching to tell. So I have something new to show you all to keep things interesting. I’ve done a couple of silver smithing classes over the last year and a half with Matt Dwyer of Fio Contemporary, learning new skills and new materials to use with my glass. The classes have been great and easy for me to do after hours now that I have a little bubby. And Matt has been uber patient and really helpful breaking down projects to manageable steps. He has loads of tools in his workshop which is awesome for getting things done quickly. 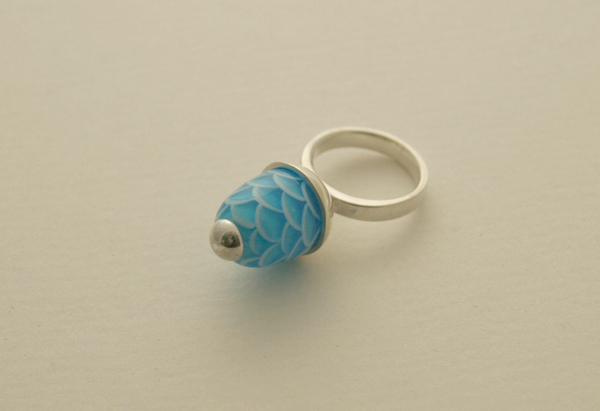 Ok, back to the jewellery. 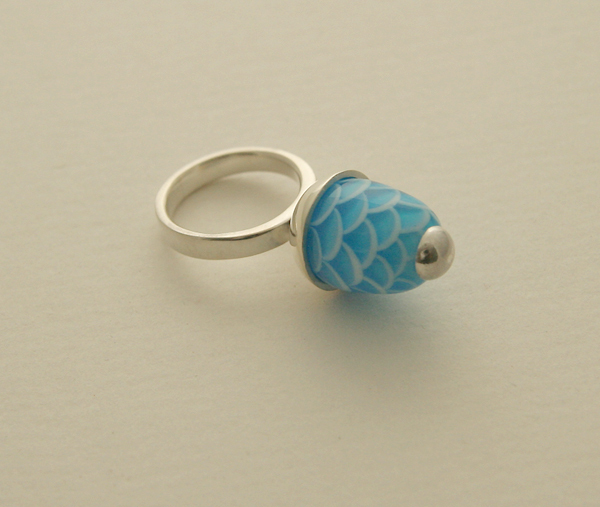 The first is a simple ring with one of my scale beads sitting in a bowl. 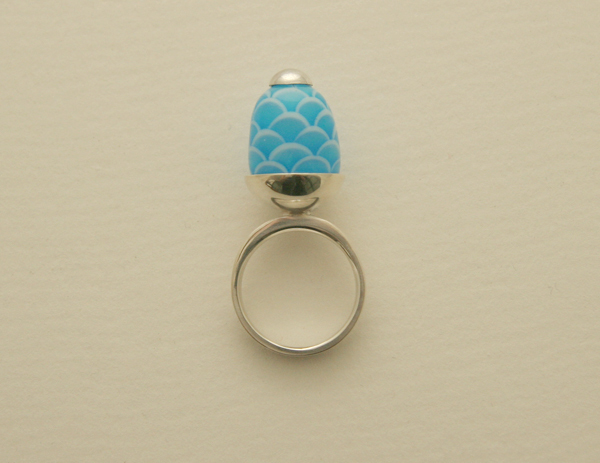 I tried to follow the lines of the bead and shape the ring and nut on the top to match. It’s a bit top heavy but it looks lovely so I don’t mind. The choice of bead really couldn’t be anything but top heavy, I guess. And I think silver just looks lovely with glass and gives it a different look to my casual leather necklaces. I’d like to eventually make different types of rings with different shaped beads on them – practising all different types of settings. 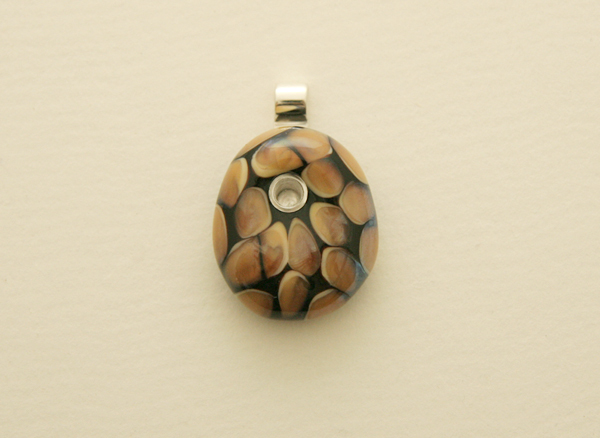 The second piece is a focal bead sitting on a pendant. 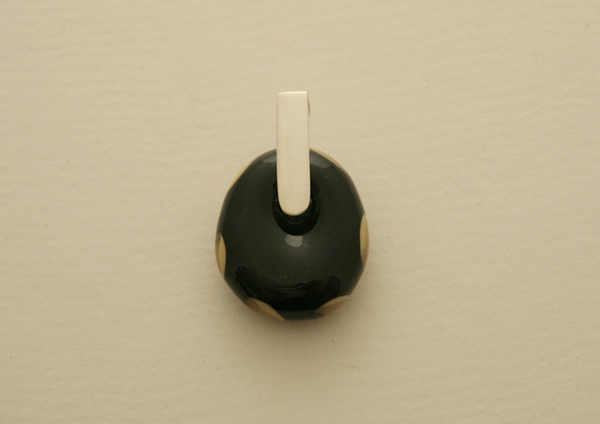 The bead is held on really snug but does move a little bit with a little bit of force. But it wouldn’t move when wearing it which is fine. I’m really happy with this one too and I’d like to make more of these pendants. 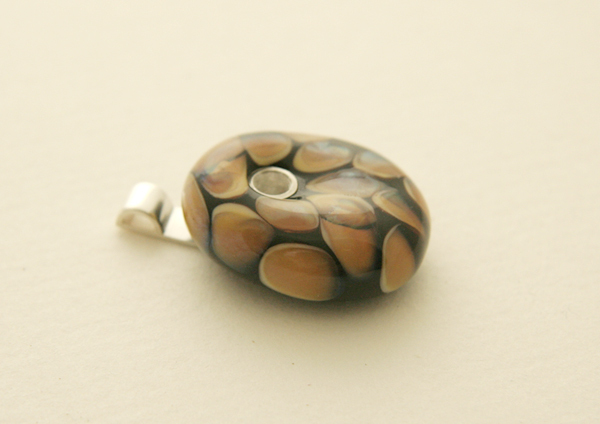 And I love the pattern on this bead so I’m going to make more beads with it but in different shapes. Pictures to come. Just beautiful Avril. The pendant looks fossil or snake like to me. Just stunning. Thanks Fiona. I like your description of that pattern – I struggle with it at times as it looks familiar but not quite like anything. I think I might use snake. Thanks!